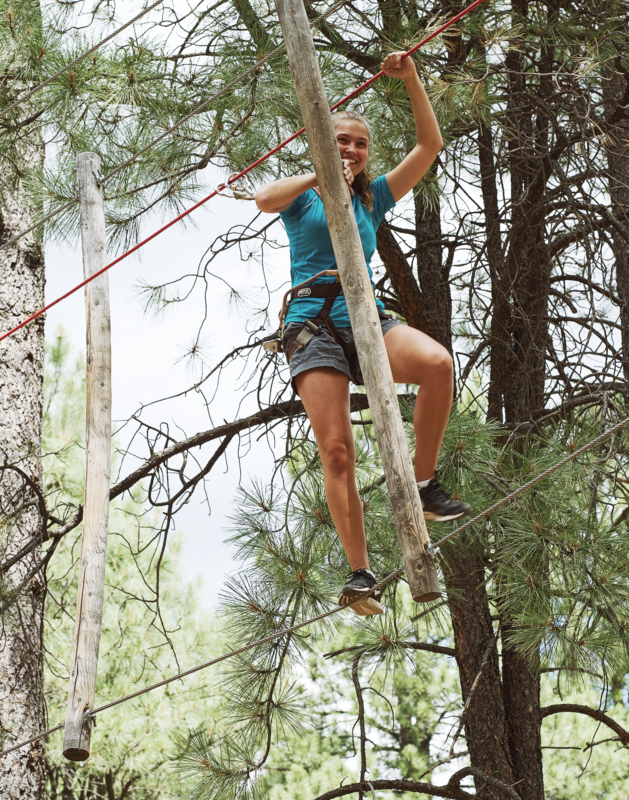 At Flagstaff Extreme we have multiple large circuits within our Adult course, each containing a mixture of approximately 10-17 different obstacles and zip lines. The obstacles range from rope swings, scrambling walls, hanging nets, wobbly bridges and suspended “surprises”. The skill level and height of each circuit are marked using a color-coded system indicating the challenge based on elevation and difficulty. Check-in, safety briefing, demonstration course and all our Adult Courses can be completed in approximately three hours. After a brief 30 minute training session, you begin on the GREEN course where you get comfortable with the equipment and the rhythm of moving through each element. SILVER is next and the cable ladders and tent elements will really start to test you! After defeating the Silver course you will move on to the BLUE course. Suddenly childhood memories of swinging on ropes and climbing trees comes back to you. Your agility and sense of freedom return and away you go! Up further into the trees you head on the RED course. Climbing higher into the trees, try not to let your emotions get the best of you. Balance comes into play when crossing wobbly bridges and swinging surprises. You’re feeling confident now, you have defeated the first three courses and can’t help laughing out loud as you zip through the forest or watch your friend try to walk gracefully across a moving obstacle. Now it’s time for the ultimate in focus and fitness: the BLACK course. Before you set off, your senses take in the natural beauty and harmony of your surroundings. You climb up even further into the tree canopy discovering that your movements are even more fluid than before. As your journey ends at Flagstaff Extreme you leave with a smile, a sense of achievement and memories that live on. The courses are meant to be used progressively and the cost of admission covers one loop or rotation through the Adult courses. At any exit point along the courses, you can descend. Walking paths will take you back to the guest services and welcome center. Get out there, and make memories that will last forever!